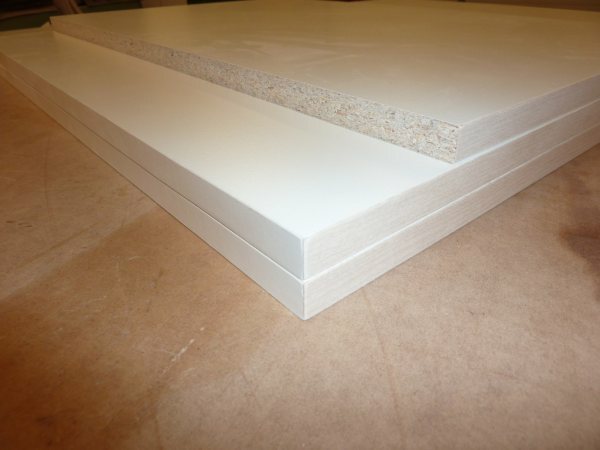 Decide on the treatment that you want for your cabinet doors and drawer fronts. 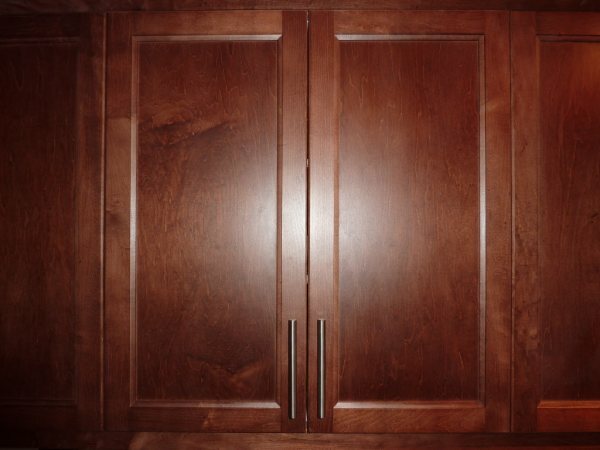 You should decide at this point on whether to use face frame construction which adds a frame to the front of the cabinets, or whether you will use flush mounted doors equal to width (less 1/8”space). The kitchen shown below was built using the Dowelmax Joinery System and features flush mounted doors and drawer fronts without face frames which is a popular way of building kitchen cabinets. 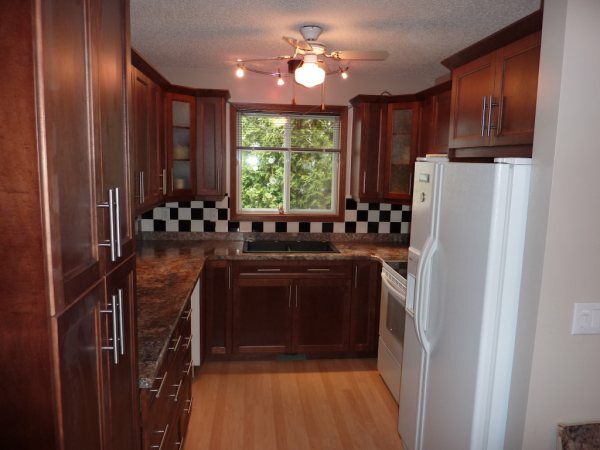 The Dowelmax joinery system was used to create these kitchen counters and cabinets. 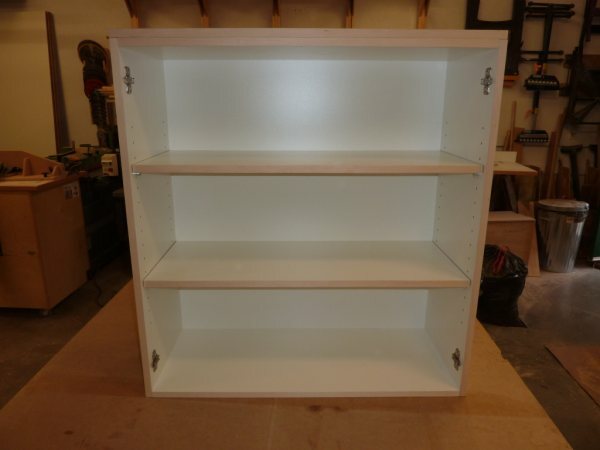 The following steps illustrate how easy it is to build professional do it yourself kitchen or bathroom cabinets. 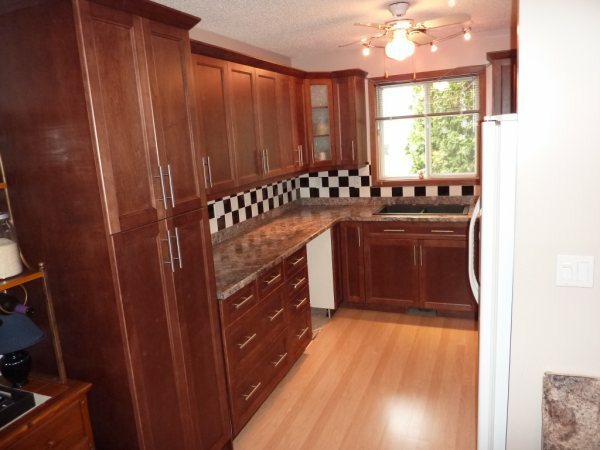 Kitchen cabinets are built in a modular fashion by creating a series of “box units” like the one above. 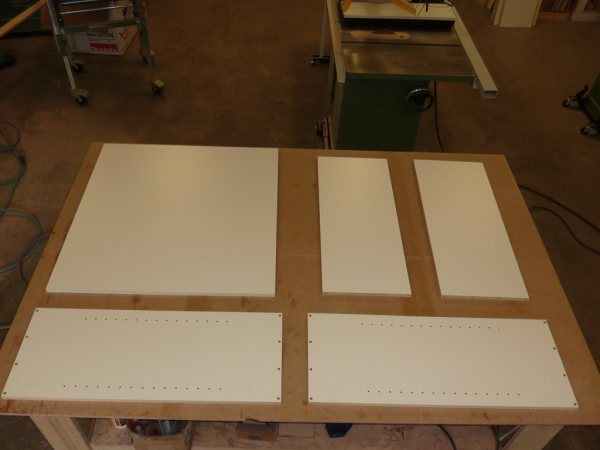 The boxes were created from 5/8”white melamine which is a standard building material for cabinets. Although the dimensions are flexible, here are some guidelines for the box units. Standard height is 36” from floor to top of counter, and a 4” kick space at the bottom is normal. 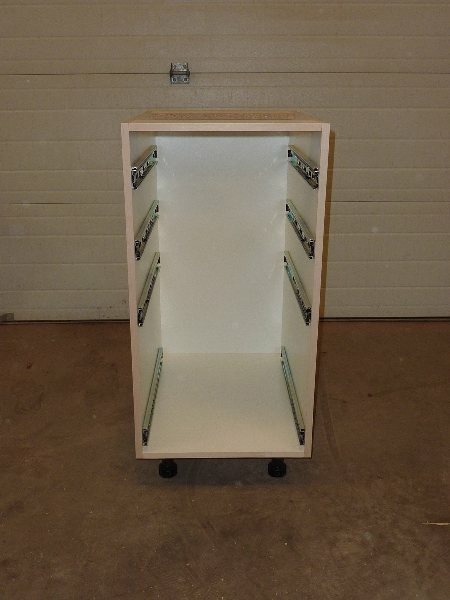 This leaves a box height of 36”- 4”- counter thickness” for the height of the box. 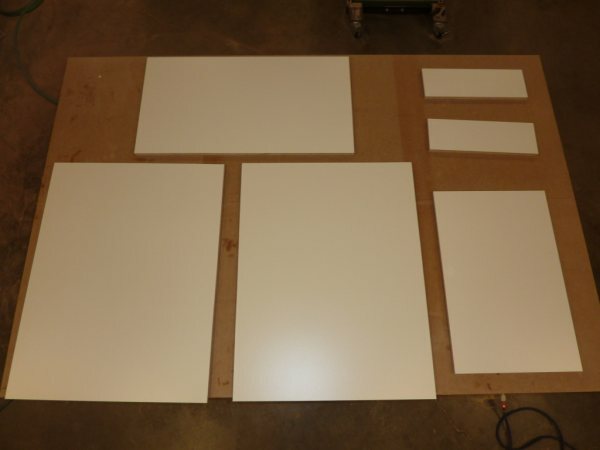 Step 1: Calculate the height, width and depth of the basic box and cut the pieces for each side, the top and bottom. Bottom – equal to width of the finished box minus 2 times the thickness of the sides (2 x 5/8”= 1 ¼”). Top rails – same width as bottom and 4 inches wide. Back – same width as bottom and tops pieces, height equal to sides less 2 x width of the top and bottom pieces. Edge banding has been glued to the edges of the cabinets that will be visible from the front of the cabinet. Purchase edge banding from your local hardware store to match the type of wood you are using for your doors and face frames. 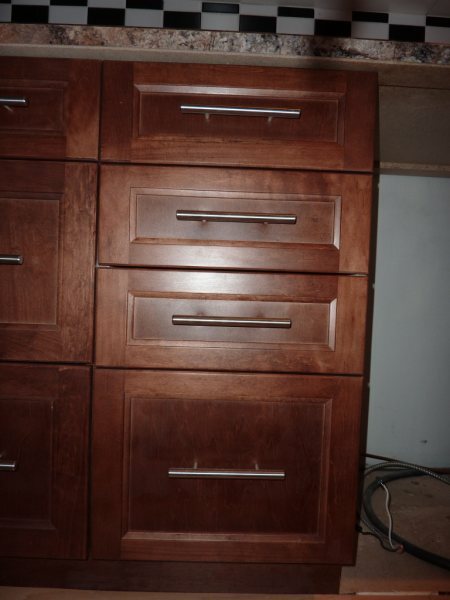 System is used to join the cabinet pieces together creating a strong joint. Do not use nails and glue as they will not hold. 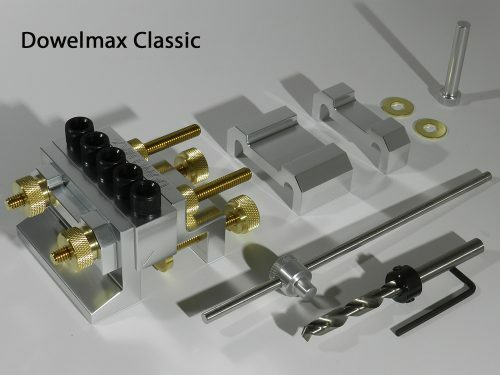 We suggest viewing the basic instructions on how to use the Dowelmax system to create precise professional joints athttps://www.dowelmax.com/instructions.html as some of the details will be left out in this step by step process. 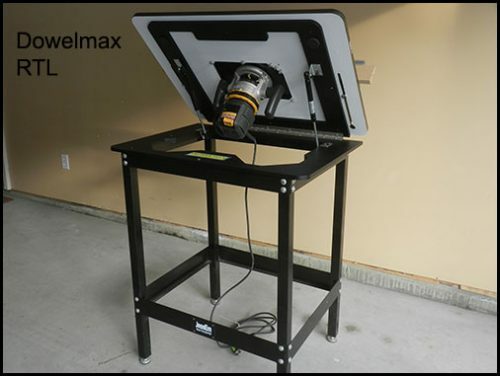 Use the Dowelmax system to drill the holes in the various pieces as shown on the right. 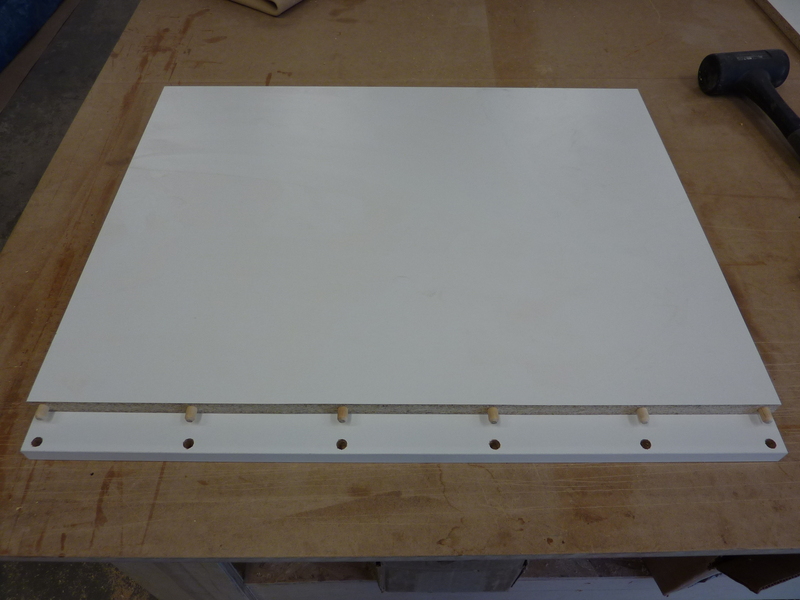 A spacing of 6” between holes will provide suitable strength for the completed box unit. 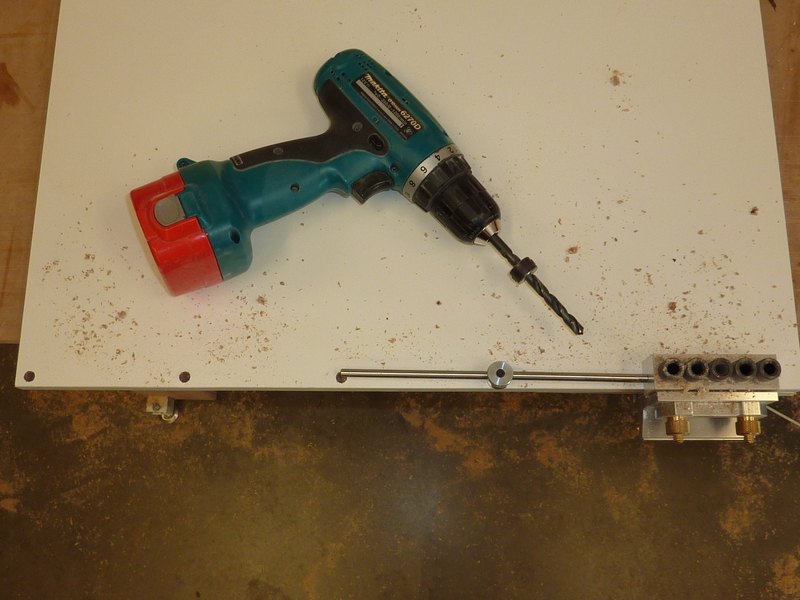 Use the extender bar to with the same setting for the complimentary holes for each dowel. 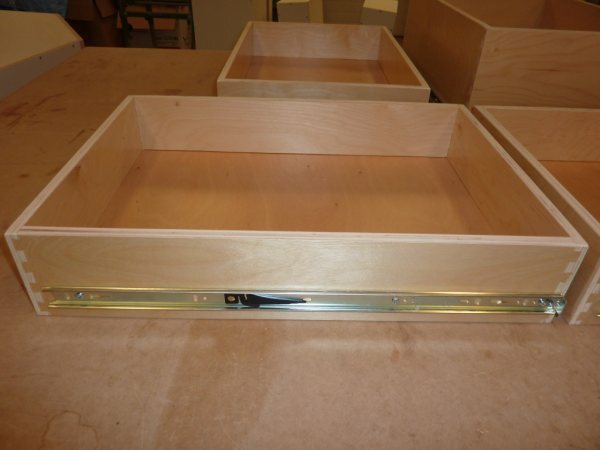 Step 5 & 6: Mount the drawer slides on the insides of the side panels according to manufacturer’s specifications. Mount the slides accurately before you assemble the box as it is easier to mark and fasten the slides more accurately. Step 6: Assemble the box by adding glue to the dowel holes and clamping the final box together. If the Dowelmax system has been used properly, all pieces will be self aligning. 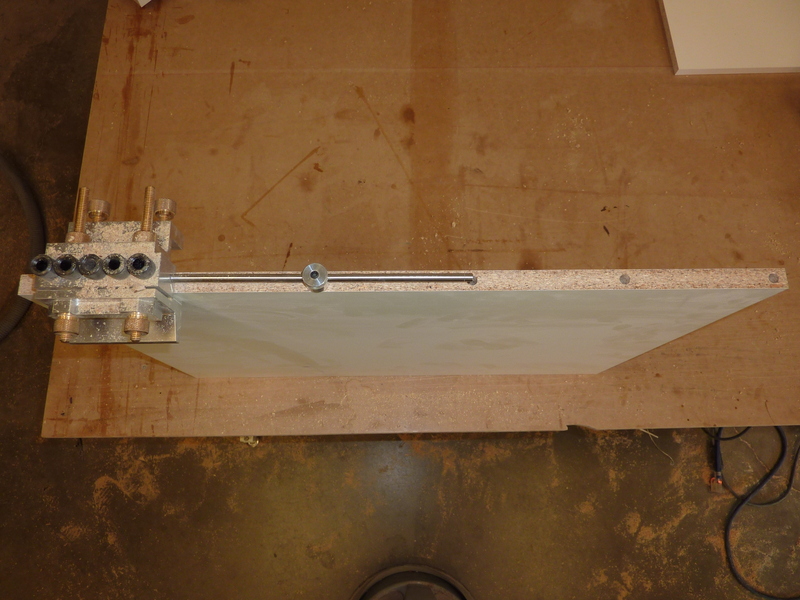 It is not necessary, but screws may be used to ensure that dowel joints are held tightly during the glue drying stage. 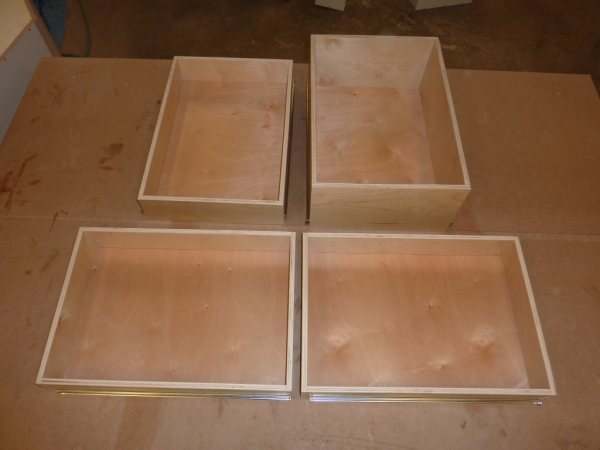 Step 7: Build the boxes for the drawers. 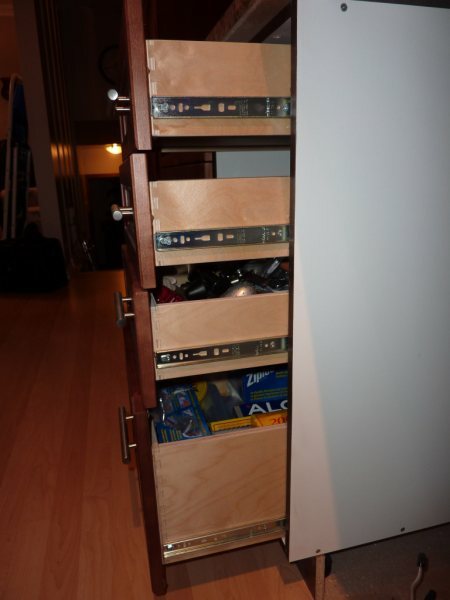 The width of the drawer should be equal to the distance between the insides of the cabinet less manufacturer specifications for the spacing of the drawer slides. Fasten the drawer slides to the drawers. 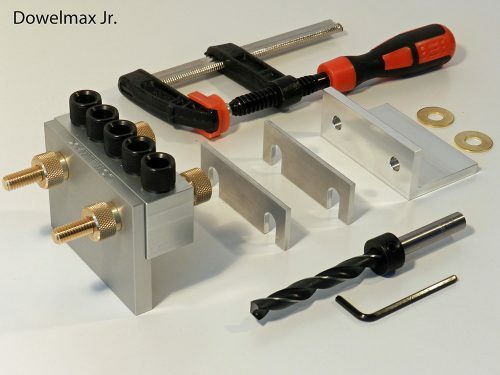 You can build the drawer boxes using box or dovetail joints, but alternately you can use the Dowelmax joinery system to create the joints which will be equally as strong, and can be created much more quickly. 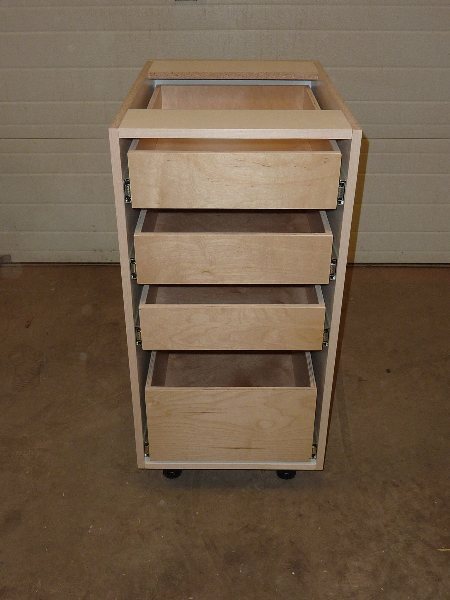 Screw the drawer fronts to the drawers and insert the drawers into the box units at final assembly. Note that drawer fronts should be 1’8”less than the overall width of the box units. 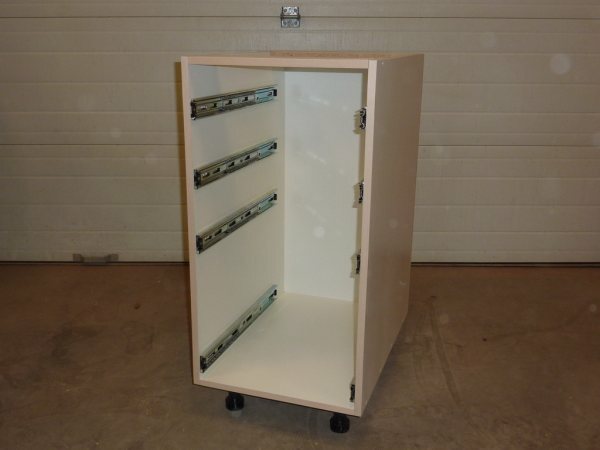 Allow 1/8”spacing between drawers for a professional job. 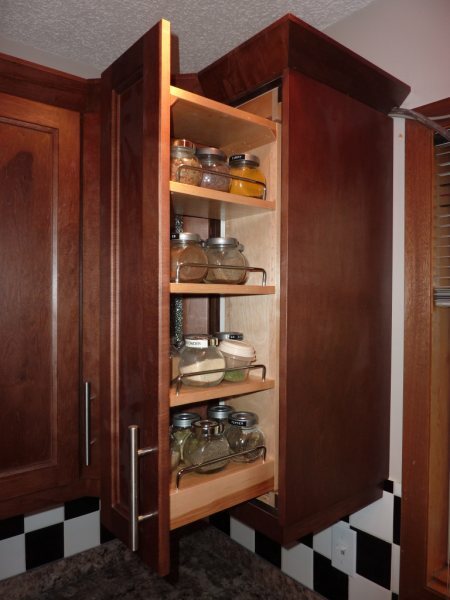 Upper cupboards are made with the same box approach. A standard height for the cabinets is 30” (although you can make them higher to go right of the ceiling) and a depth of 12”. (If you are using face frames, subtract the width of the face frame from the 12”.) In the example shown to the right, we have made cabinets that go the ceiling. 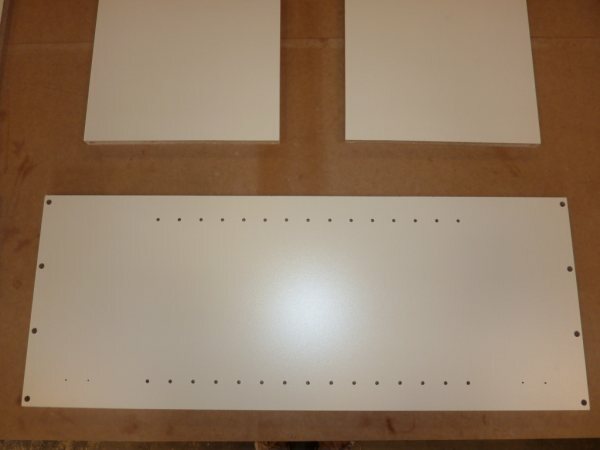 You will want to drill holes for the shelf guides prior to assembly as shown at the right, and the guide holes for Blum style door hinges prior to assembly. Step 9: Stand back and admire your professional job. 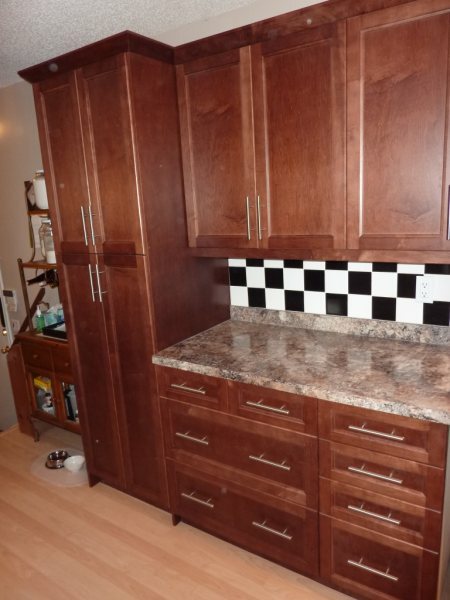 The following pictures show how easy it is to build professional kitchen cabinets and cupboards using the Dowelmax system to make strong professional joints.